The team at GripTek has many years of experience in the industry, offering anti-slip solutions and products that make your floors safe from slips. Using an exclusive range of proven anti-slip solutions and cleaning products, GripTek is proud to offer an industryleading 6-year warranty. See test sample of our Sleek Grey Contemporary Marble below. Test result before treatment is a P4 50BPN rating, after treatment is a P5 60BPN rating. There is almost no change to the appearance of the tile. 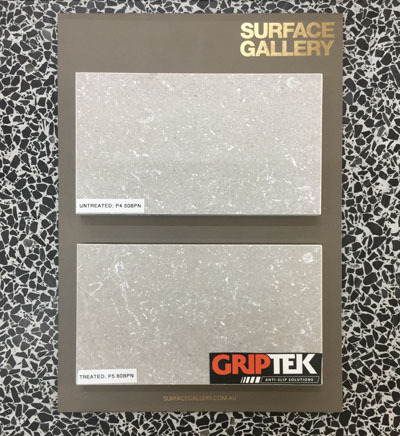 GripTek utilises the latest testing technology to rate your floors to check if they conform to relevant Australian Standards, such as AS4586:2013 (new surfaces) and AS4663:2013 (existing surfaces). Using a Wet Pendulum we determine the friction co-efficient of any hard surface. Book a slip test today to check your level of compliance. We provide Slip Rating classifications as a guide, based on a slip test report. As we have no information on the ultimate environment in which the tiles will be laid, we are not responsible for the suitability of the tiles for the environment in which they are laid. Our tiles may achieve an acceptable rating in a laboratory test, however it is quite possible that the performance in-situ will be less than expected due to unforeseen circumstances, such as grouting, wear and tear, or build up of residue. Variables such as floor levels, water, oil and other contaminants affecting tiles are beyond the control of the supplier. AS.HB.198 2014 Table 3A and 3B, which indicates locations that correspond to the relevant Pendulum and/or Ramp ratings. We note that if these results have a value that may appear acceptable, the results must not be interpreted that Surface Gallery Pty. Ltd. will provide any liability against damages for slipping on tiles. You should at all times provide information to your clients that all floor tiles can be slippery, especially when wet. Many tiles which can be slippery when wet are commonly used in wet areas, such as bathrooms and kitchens. All customers should be aware of wet tiles, and seek advice from the relevant consultants as to the level of slip-resistance of any particular tile and its suitability for the intended application, as no liability can be accepted for personal injury or accidents arising from slipping or falling, under any circumstances.